Set 8533 Gali is a canister set released in 2001 portraying Toa Mata Gali. Gali, the only female Toa, controls the waves themselves! When she's angered, she can cause tidal waves and storms. Explore the waters around Mata Nui with her and use her powers to fight Makuta. Her hook arm helps her get out of trouble when danger threatens. The Gali set was released in 2001 as one of the six Toa sets. The set consists of thirty-five pieces. By combining pieces from Gali with 8535 Lewa and 8536 Kopaka, one can build Wairuha. The set can also be combined with 8531 Pohatu to make a Mata Nui Cow. Some Gali sets contain a Toa Mata Mini Promo CD. Gali's arms can be swung up and down by turning a gear in her back. This function can be used to try to knock off the mask of another Toa or Rahi set. Gali wears a translucent blue Kaukau. 8533 Gali scored a total of 76 on Brick Insights, indicating average reviews. 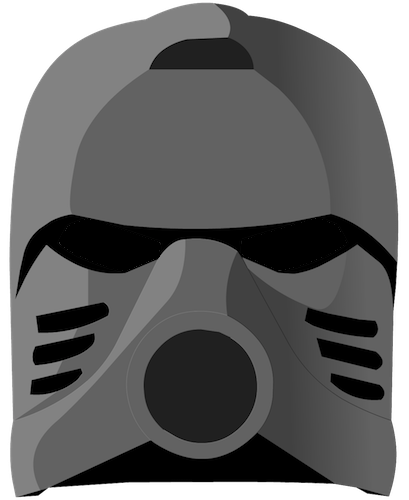 The transparent blue element of the mask was often noted for its unique quality when compared to other Kanohi. This page was last edited on 7 April 2019, at 04:35.